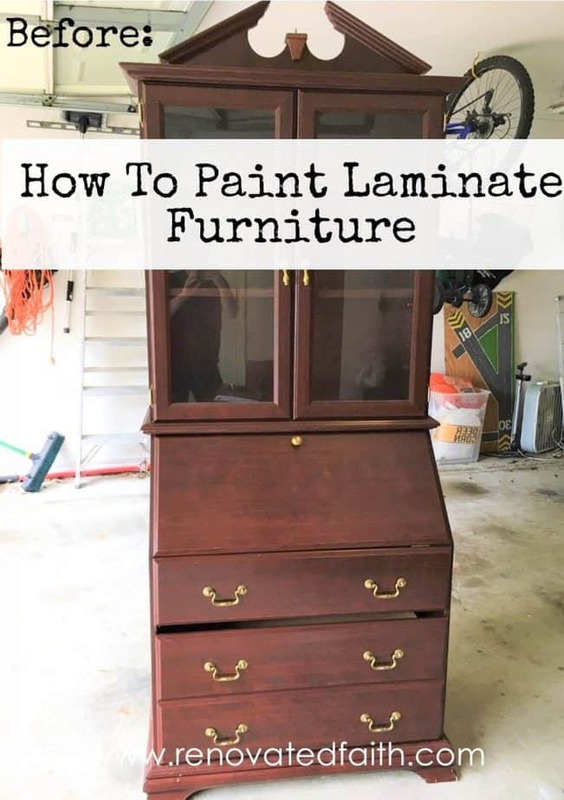 Not only is there a right way to paint laminate furniture but there are some tricks that will make your project look like a solid-wood piece that had been refinished. 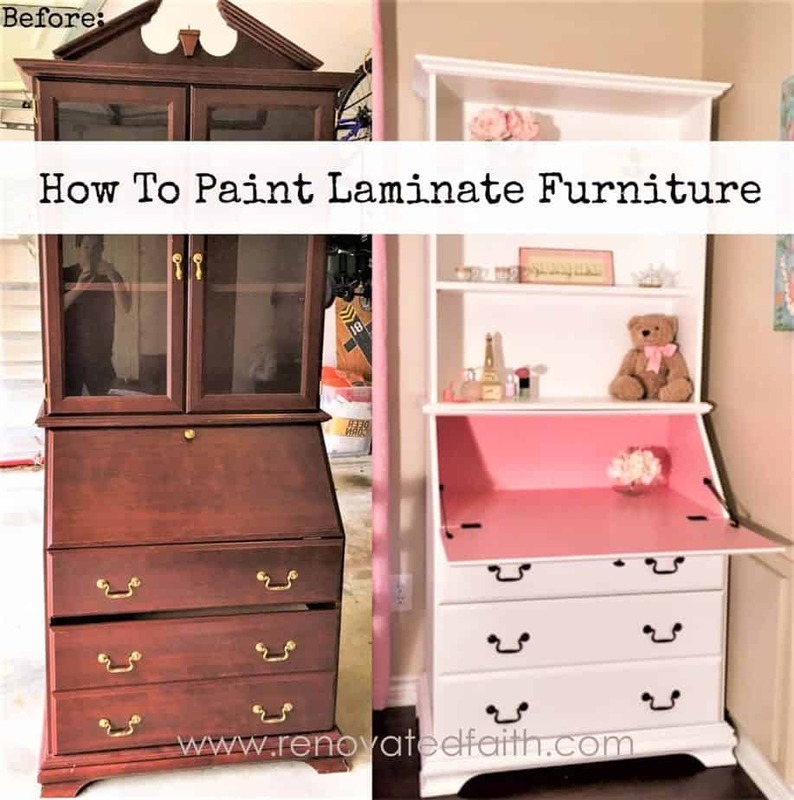 Knowing how to refinish laminate furniture gives you so many more options when you are on the hunt for a new project piece! No longer are you limited to solid wood but now you can redo just about any surface by knowing a few special tips. Here is a piece I got a little cocky with… I thought I could get away without using a primer because there was primer in my paint. I was wrong! 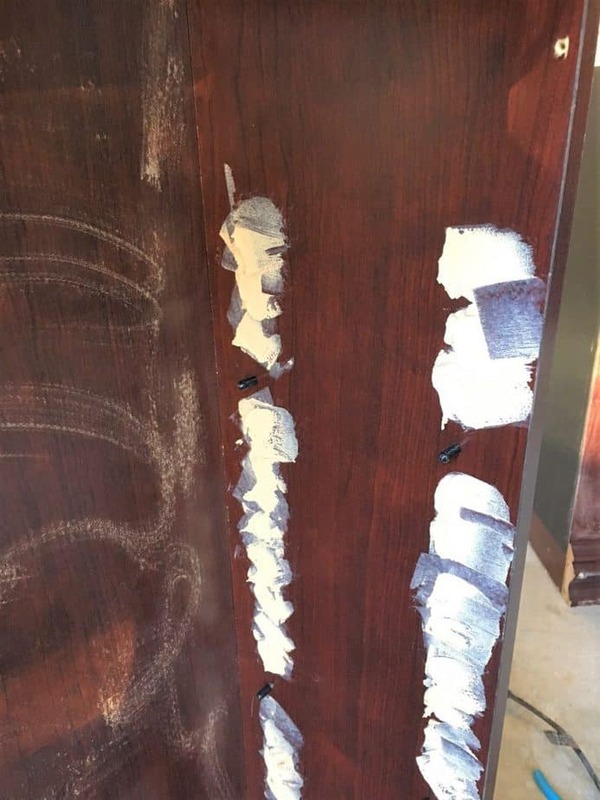 You can see how the paint did not adhere and just slid off the surface. Fortunately, through a lot of trial and error, I’ve learned what to do and what not to do when painting laminate. First of all, what is laminate furniture? 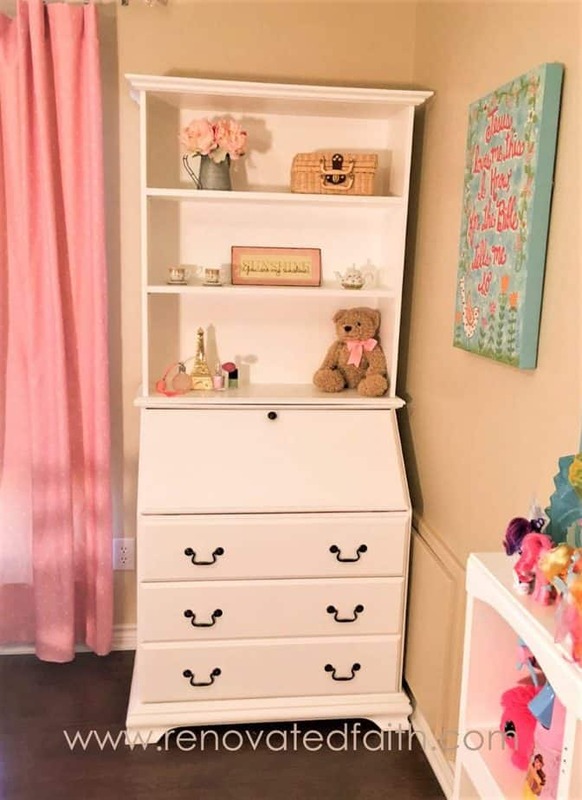 It is furniture made mostly of medium density fiberboard (MDF), which is composed of small shavings of a of lower quality wood pressed and glued together. Therefore, it’s strong but highly susceptible to water damage (this process will help to protect the surface though). A very thin printed sheet of wood covers the MDF to mimic the look of solid wood. 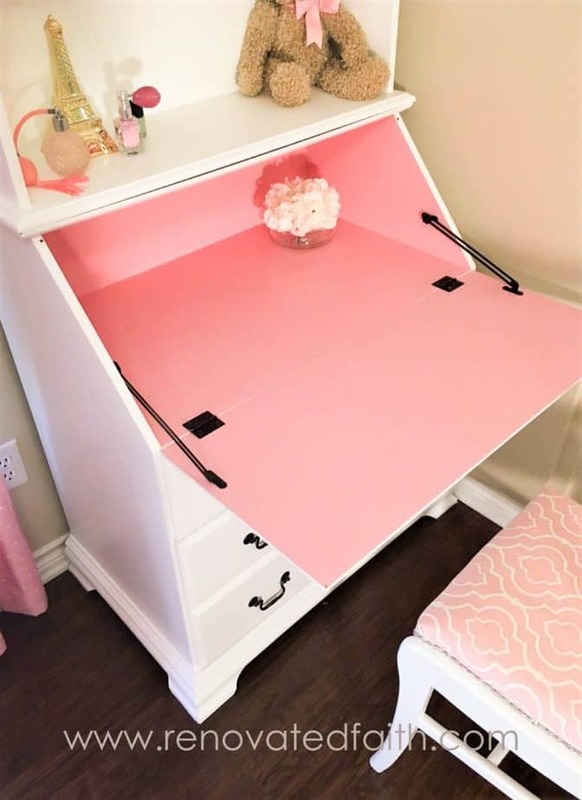 I saw this secretary desk online and knew it had potential! I thought it would be perfect to refinish as a desk for my daughter Morgan. I did not realize it was laminate until I saw it in person but that didn’t stop me! 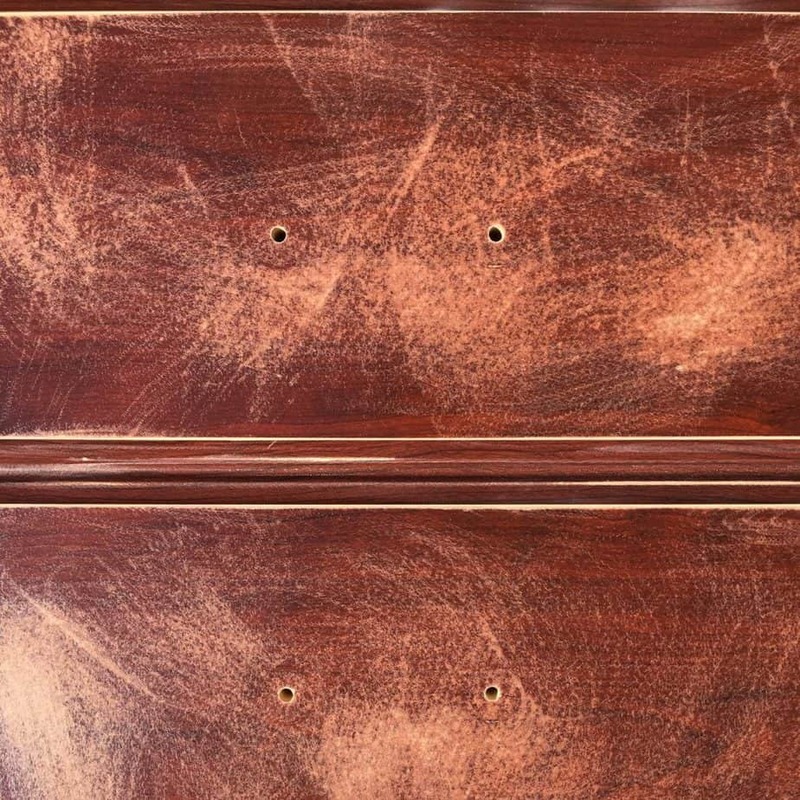 FURNITURE BUYING TIP – The good thing about mistakes is that you learn from them. I had committed to buy this piece before I saw it, not realizing it was laminate. 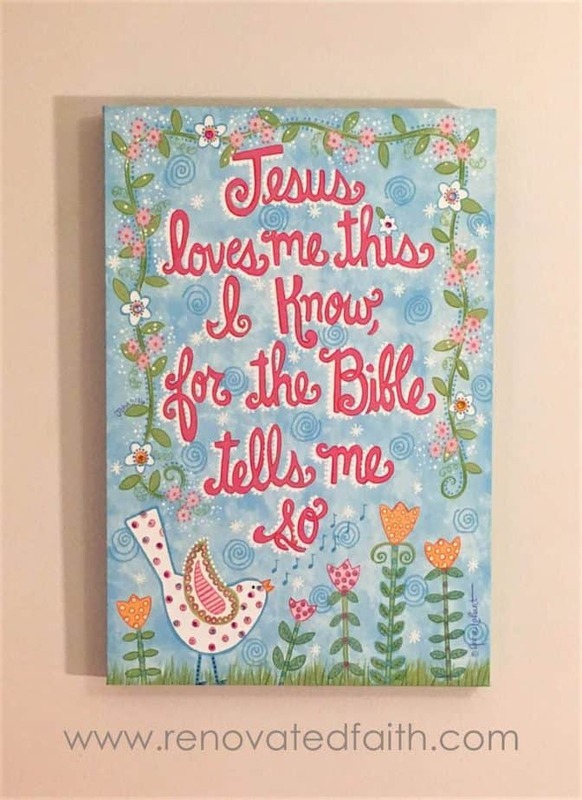 I still probably would have purchased it but I probably paid more than I would have because I could have haggled some based on the fact that it wasn’t solid wood. Lesson learned! Electric Mouse Sander – Who wants to sand by hand when you could use an electric sander?!? They are SO easy to use. If you know how to iron, you already know how to use a sander! It will make any project go so much faster with very little effort on your part. I’ve used this one for only $13 on amazon.com and was happy with it. Zinsser Bullseye 123 Primer – This is a water-based primer that levels well, dries fast and is very low-odor. It’s good stuff! 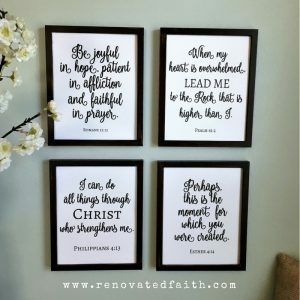 Paint – I used Behr Ultra in Satin but also really like Sherwin Williams. Behr is cheaper but doesn’t cover as well. Unscrew all the hardware and put it aside in a plastic baggie. I also removed the trim from the top. Fortunately it just unscrewed. Laminate furniture pieces often have several rows of peg holes so the shelves can be adjusted easily. 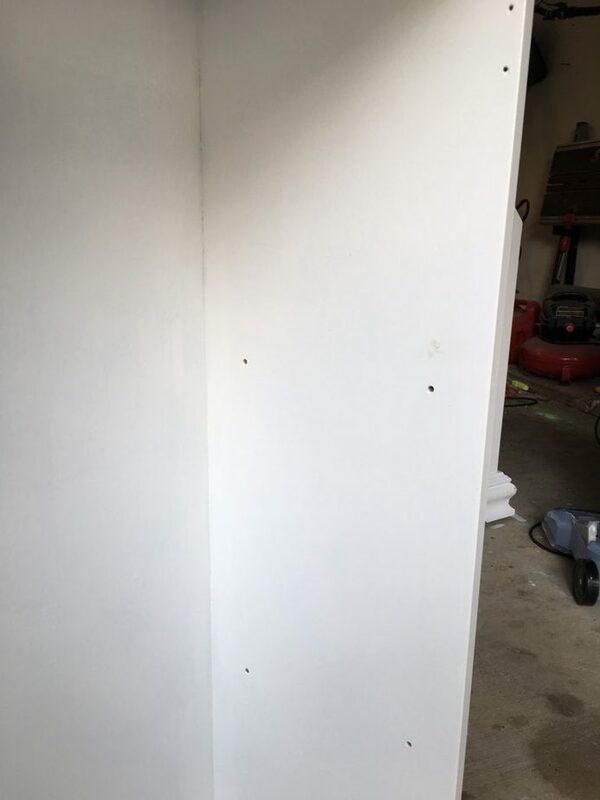 It can be a dead giveaway that a painted piece is laminate and not solid wood so I like to fill these holes before I sand. To fill them, I used my putty knife to glop on the wood filler. 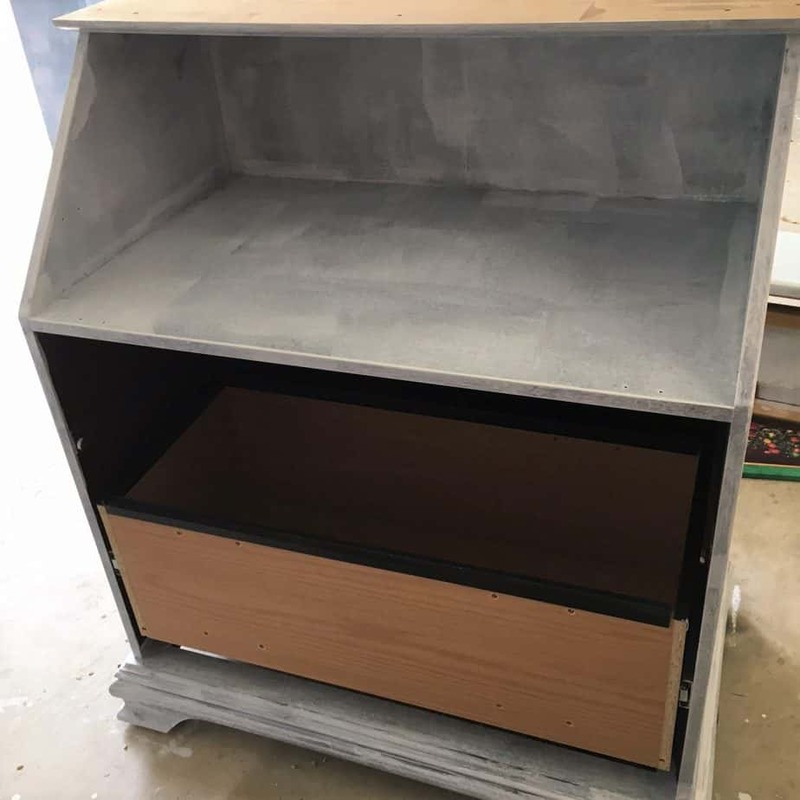 You want to put it on thick because when it is time to sand, you will sand down to the level of the top of the hole. Wait a day for the wood filler to dry before sanding. Here is a pic before sanding and after sanding. I also filled some gaps in the legs before sanding out some serious water damage. 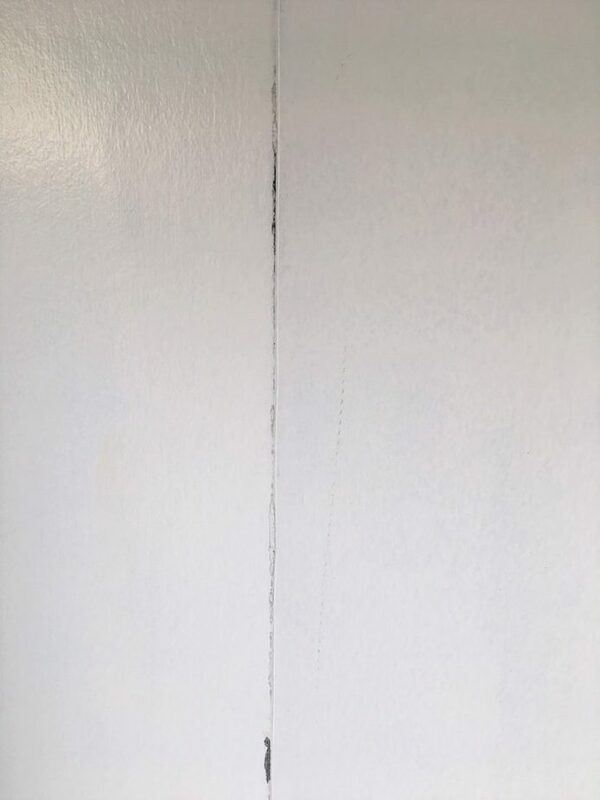 Priming this piece will make it less susceptible to water damage like this in the future. While your sander is still out, sand down the edges just slightly. One difference between laminate furniture and solid wood is the edges of laminate furniture are much sharper and straighter, almost plastic-looking. 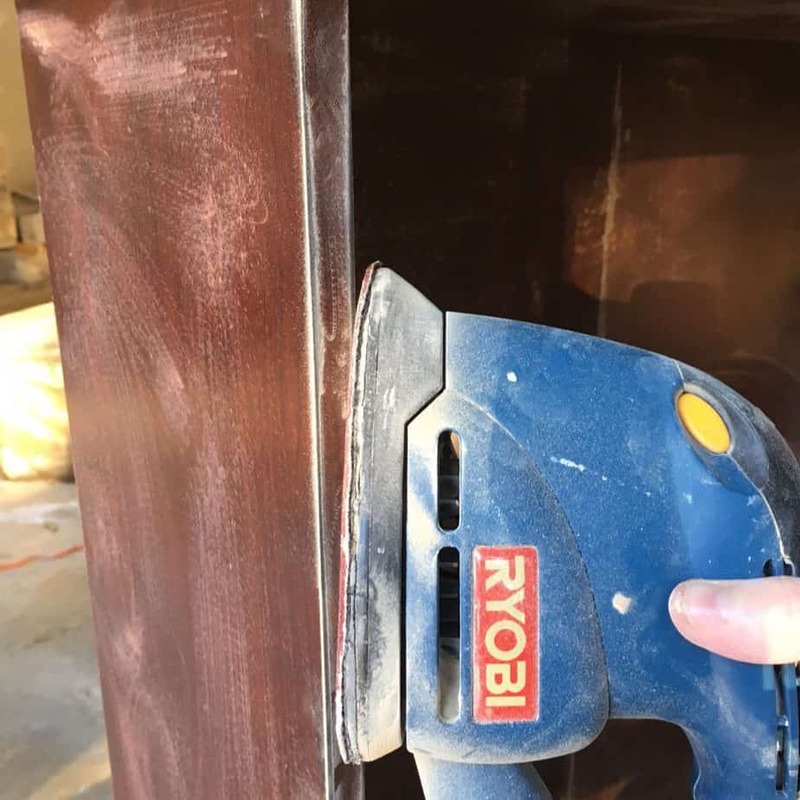 Solid wood edges are slightly rounded so you want to simulate this look by running your sander along the edges like so. See how I’m barely sanding that edge. 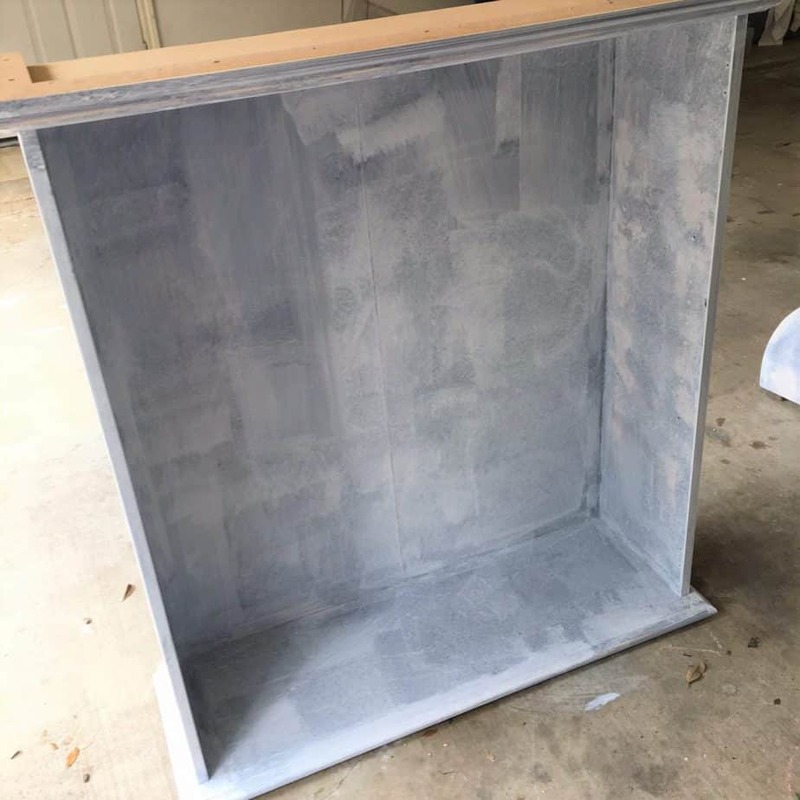 Once your piece is sanded, you can wipe it off with a damp cloth before priming. Paint on your primer with a brush in one THICK coat. You will be able to start painting in one hour because it dries so quickly. After your primer has dried, paint on your first coat of paint. I like to use a roller or you can continue to use your brush. 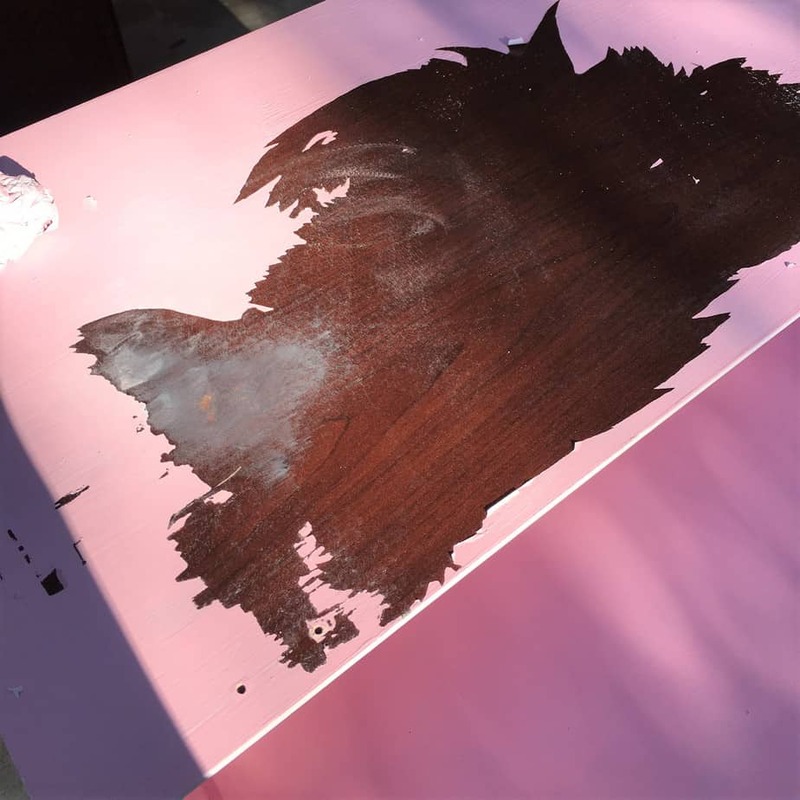 This is not necessary but before the second coat of paint, I like to sand over the piece very lightly to get the paint strokes or roller marks out. Like I said, this is not required as I’m a little OCD. ***You can also add some Floetrol to your paint according to the directions on the back (optional). Floetrol makes your paint dry much smoother but keep in mind it takes long for that coat to dry. Often the back panel of laminate furniture is a very thin piece of wood with long vertical seams. 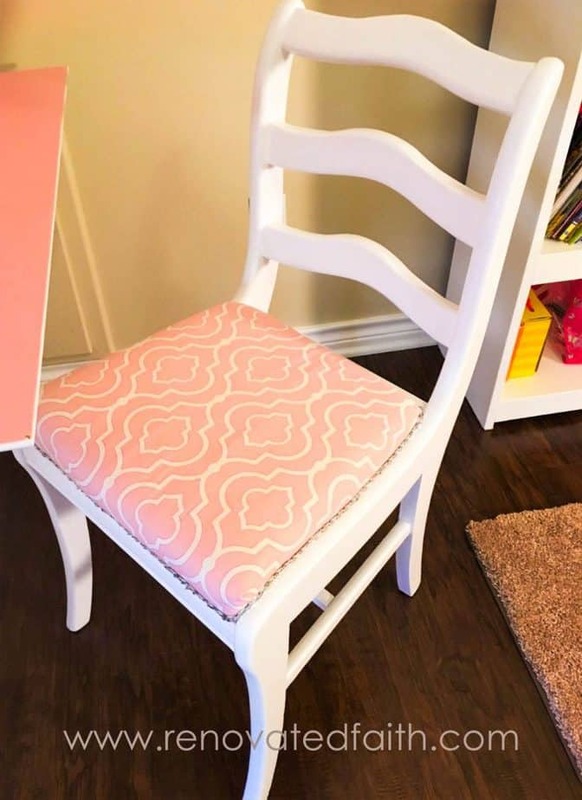 The seams are another giveaway that your piece is laminate so I like to fill those seams with caulk. You can see the seam more clearly since I sanded. 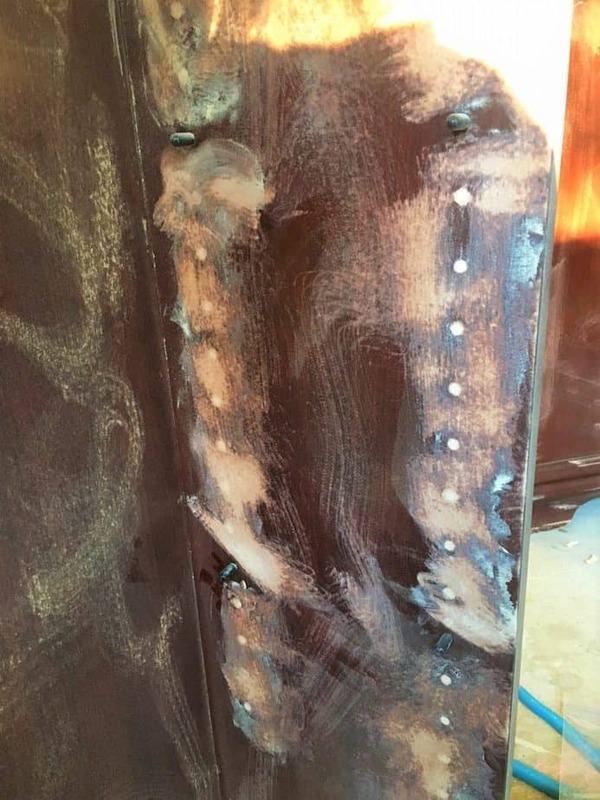 You want to use caulk instead of wood filler on these seams because the panel is flexible and so is caulk. If you don’t have a caulk gun, you can get a tube like this. Squirt the caulk on the seam like toothpaste. It’s okay if your line is really messy! Then wet your index finger and smooth out the seam. Wipe off any extra on the edges with your finger or a baby wipe. Paint on your final coat just like you did the first. Normally, I would try to get away with one thick coat of paint but usually on lighter colors I need to add two coats. It also depends on the coverage of the paint you use. I bought some new hardware and also spray painted the existing hinges. After the paint dries 24 hours, you can add the hardware. Didn’t it turn out cute??? 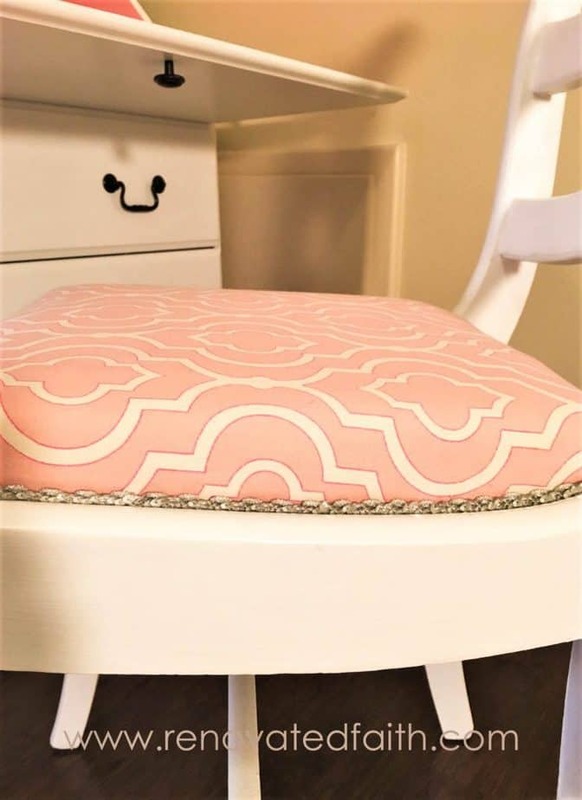 I made over a chair to match and added some sequin trim to give my girl some bling. Now I have a beautiful piece of furniture that no one would ever guess is laminate! It works so well in Morgan’s room. 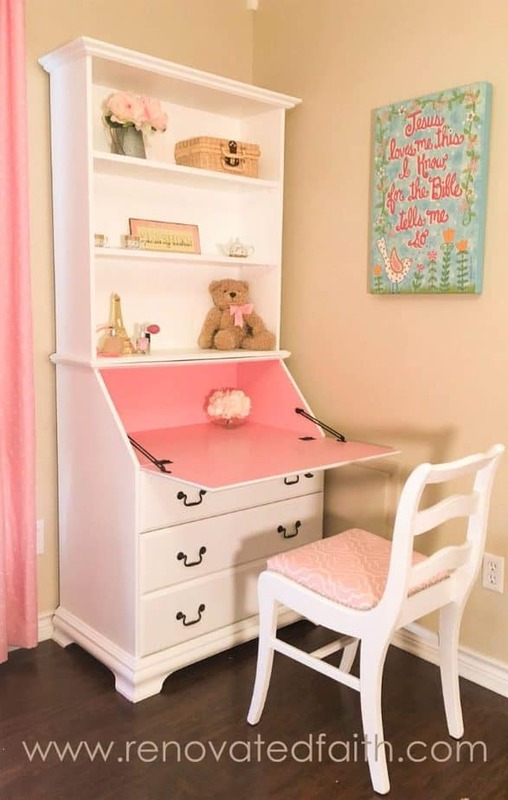 Secretary desks are such a perfect addition to any kid’s room because they don’t take up much space but are essentially a bookshelf, desk and small dresser in one! Wow, Karin. I’m impressed! That turned out so pretty. You got me wanting to go out and find something to re-do! Oh good! I was hoping it made sense! Glad you feel you have added confidence Geniece. Thank you so much! I’ve used this process multiple times and have a lot of success with it. Thank you for your kind words! That desk turned out beautiful! I am very impressed. 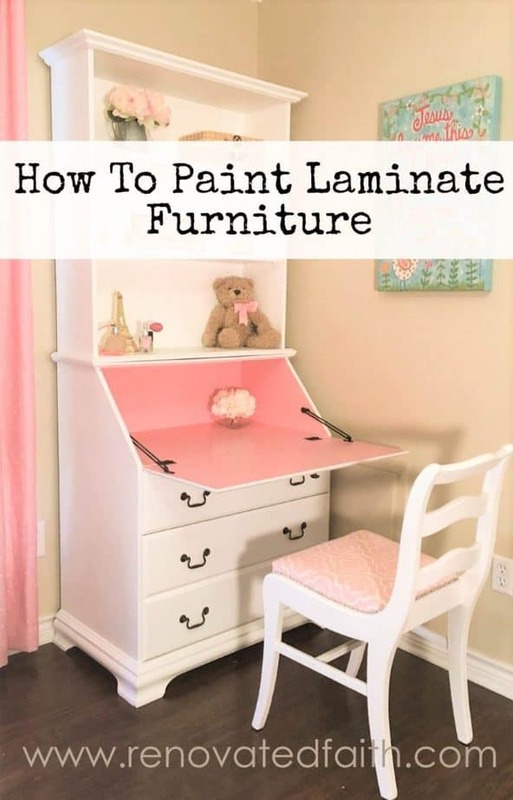 Have you had any difficulty with laminate furniture like bookshelves bowing under the weight of books, etc? I know a lot of the laminate furniture I have had in the past tends to sag under added weight. That is the only thing that makes me hesitant to use laminate!! Great question! It just depends on the thickness of the shelf. On one wider bookshelf, I put a 1×2 piece of wood in the center of the bottom of the shelf running along the length. I think I just glued it and that added some extra support and you can’t see it. Hope that helps! 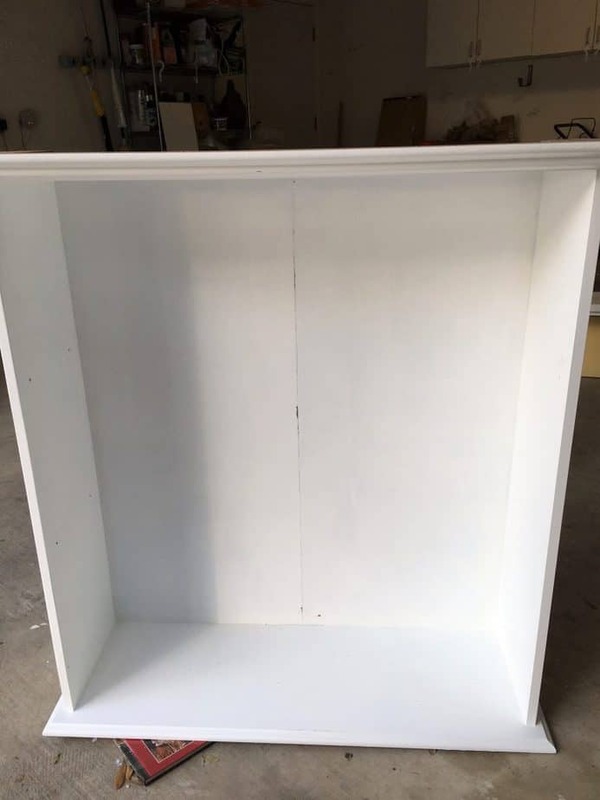 You can also add a 1×2 along the face of the shelf perpendicular and level to the shelf. That would make it nicer looking and also sturdier. Good ideas! That way you don’t waste the old shelf! This looks amazing! I did not know you could paint laminate. I just may have the courage to try after seeing this! Great post, thanks for sharing! I nominated you for the Versatile Blogger Award. You can read more about it using the link below. Can’t wait to read your post and learn more about you!